The quest for human centred development is a fitting foundation to create the workforce of the future and can only be achieved if countries invest diligently in people’s capabilities, the institutions providing work and in decent and sustainable work for them. The President of Namibia and current Chairperson of the Southern African Development Community traveled to Durban on Friday to attend the launch of the International Labour Organisation” launch of the Global Commission on the future of work report. “I agree with the recommendation that future approaches should seek to directly incentivise job creation as a key target rather than a by-product of economic policies that otherwise pursue other objectives,” President Geingob said during an address to the gathered dignitaries. 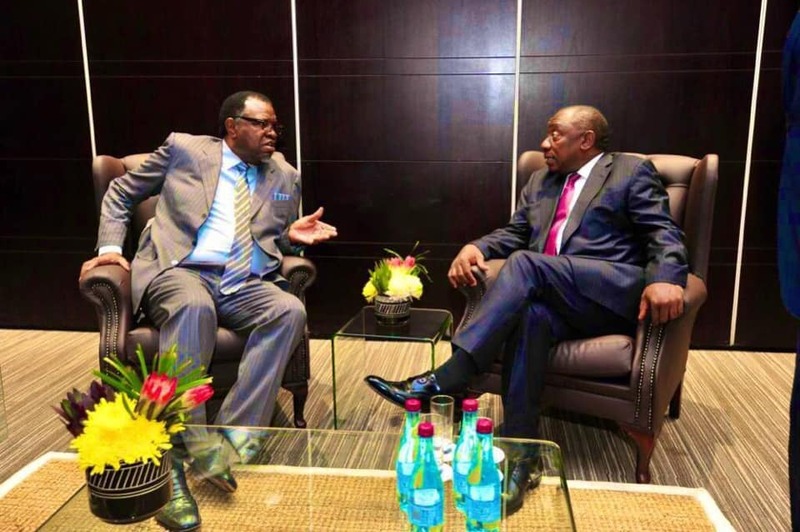 President Geingob also met and held talks with his South African counterpart, President Cyril Ramaphosa on the margins of the Launch of the #ILO100 Report on the Future of Work. 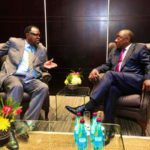 The two heads of state discussed a range of issues of mutual concern for the two countries and the SADC region. It is an honour for me to be accorded the opportunity to deliver some remarks during the occasion of the launch of the International Labour Organization (ILO) Global Commission’s Report on the Future of Work, which has been prepared for our consideration, regarding the kind of future which will emerge from the ongoing transformation of our societies. It is a great pleasure for me, in my capacity as the Chairperson of SADC, to congratulate my dear brother, His Excellency Cyril Ramaphosa, for having successfully co-chaired the work of the ILO Global Commission on the Future of Work, since 2017. The Global Commission launched its Report on “work for a brighter future” on January 22, 2019, and today we are privileged to dialogue on its critical elements within an African context. As we celebrate the ILO centenary this year, we pay tribute to this esteemed organisation, which has remained resolute in advancing the notion that people should be at the centre of real progress in the modern day global society. The SADC region solemnly identifies with this ideal and as such, fully lends its support to the present report, which is anchored on the proposition of “a human-centred agenda for the future of work”. We welcome the perspective that the best future outcomes will be guaranteed by conscious decisions that ensure that the pace of technological change is determined by human capacity to drive it. However, this means that considerable investments must be made to support education and skills development that will swiftly and adequately respond to new developments. As a top priority, the education curricula in our region needs considerable reorientation to better respond to emerging and future labour market needs. It is only in this way, that the labour market can play its stabilising role as a source of income and livelihoods for the majority. The Report recognises that the workplace is principally made up of human beings and, therefore, an arena that holds significant prospects to advance society through strengthened governance systems and regulation. Bold measures are therefore suggested, including the establishment of a universal labour guarantee that includes the right to an adequate living wage, as well as a safe working environment. I am confident that sooner rather than later, we will all appreciate the value of these high ambitions and also realise that if we aim for any less we would be abandoning our duty of care towards our children and future generations. These investments are urgently required, given that despite the positive economic growth rates registered by our countries over a long period of time, the effect on employment growth has been very minimal. The high rates of unemployment and underemployment in our countries therefore already present formidable challenges for our countries, particularly regarding youth unemployment. I wish therefore to agree with the recommendation that future approaches should seek to directly incentivise job creation as a key target rather than a by-product of economic policies that otherwise pursue other objectives. As SADC continues to implement the SADC Industrialisation Strategy and Roadmap (2015-2063), which is premised on transformative and structural changes of economies with a goal of having innovation driven economies by 2063, the key elements of the fourth industrial revolution will need to feature prominently in our implementation strategies and programmes. Our focus will be on strengthening growth drivers linked to the potential of priority value chains, particularly agro-processing, mineral beneficiation and pharmaceuticals. Key enablers in this regard have been identified as Energy, Intellectual Property Rights, Skills, Information and Communication Technologies and private sector investments, among others. With respect to all these dimensions, SADC is currently in the process of developing a regional strategy on the fourth industrial revolution and I have no doubt that the Global Commission’s report will be a valuable reference. With these remarks, Chairperson, it is an honour for me to once again commend the Report of the Global Commission and assure you all that SADC, through its structures, will give due consideration to it and fully participate in follow-up actions. The quest for human centred development is without a doubt a fitting foundation for the future work of the ILO.